In 1996, a Maryland Geological Survey Report documented the presence of a brackish water interface, more commonly known as saltwater intrusion, in the Aquia aquifer in a defined area of the Annapolis Neck Peninsula. 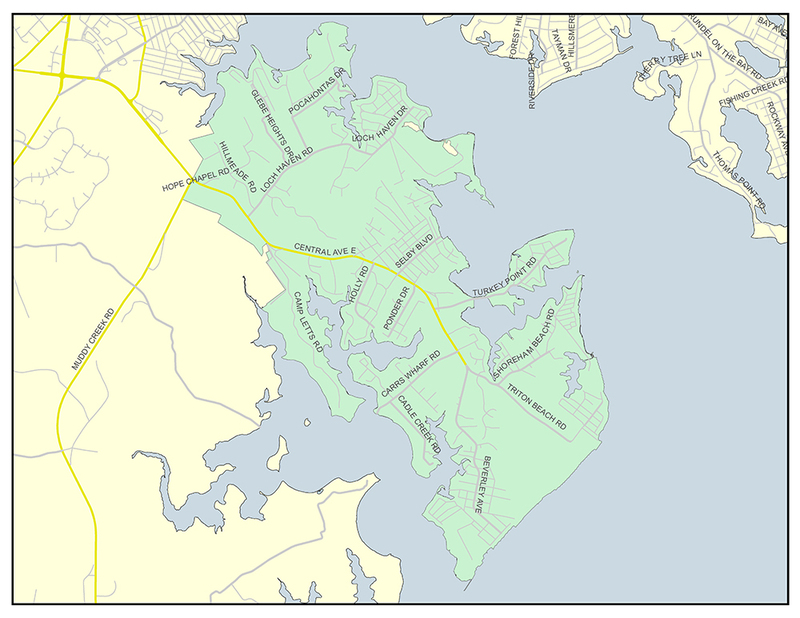 After the lift of a moratorium on new sewer connections in the Mayo Peninsula that began in 2008, there was the concern of an increased draw to the Aquia aquifer. The Anne Arundel County Department of Health contracted the Maryland Geological Survey in 2017 to conduct a study on the current quality and quantity of available water in the Aquia aquifer. The study also addressed the projected impact of additional development and private water wells to the aquifer. The study has been completed and is available for view at EFFECTS OF INCREASED WITHDRAWALS FROM THEAQUIA AQUIFER ON THE MAYO PENINSULA, ANNE ARUNDEL COUNTY, MARYLAND WITH AN EVALUATION OF WATER QUALITY. The results indicate that the expected maximum new homes that could be built in the area according the County Office of Planning and Zoning would not have a significant impact on the quantity of available water in the Aquia aquifer. However, the study did find that the quality of the Aquia aquifer could be impacted by the additional wells. The study projects that an increase in new water wells could result in an increase in saltwater intrusion in parts of the Mayo Peninsula. Therefore, in January 2019 the Department of Health instituted a permanent drilling requirement for wells within the Mayo Peninsula. The requirement had been in effect on an interim since October 2017. The requirement will allow the drilling of wells in the Aquia aquifer for replacement of existing wells only. All new wells must be drilled to the deeper Magothy aquifer. It is recommended by the Maryland Geological Survey that this requirement will help to preserve the existing wells in the area and prevent additional drawdown of the Aquia aquifer. Under Maryland regulation COMAR 26.04.04.05, the Department of Health has the authority to require this special condition on well construction permits as a measure to protect public health. The special condition requires that a new well must be drilled and sealed to a minimum depth of 300 feet or the Magothy aquifer, and the annular space must be grouted with Portland cement from 20 feet above the gravel pack to five feet below the land surface. The gravel pack may not extend more than 10 feet above the well screen level. The annular space may be backfilled up to 20 feet above the gravel pack. Up to six pounds of bentonite may be added per each 94 pound sack of Portland cement. If bentonite is added, additional water may be added at a ratio of one gallon per two pounds of bentonite. Replacement wells can be installed in the Aquia aquifer and are not subject to the special condition requirement. For replacement Aquia well permits, the owner will be required to acknowledge the potential for saltwater intrusion and that chloride levels from saltwater intrusion in excess of the secondary drinking water standard are not an enforceable standard under the certificate of potability. Saltwater can affect the aesthetic quality of drinking water and may corrode household plumbing. For the Acknowledgement Form, click here. For more information, contact the Department of Health’s Well Construction Program at 410-222-7398 or hdwelldesk@aacounty.org.